ABBA - LIVE. cassette tape from Por tu gal. ABBA GOLD Greatest Hits. cassette tape from Por tu gal. THE BEST OF ABBA 4 cassette tape set. 4 cassette tape set from Por tu gal. (SOS, Honey Honey, Mama Mia Fernado and more. Number POLS266). Cassette & sleeve is mint condition! Cassette tape from Por tu gal. ABBA The Singles - The First 10 Years. cassette tape from Por tu gal. ABBA - MORE ABBA GOLD. cassette tape from Por tu gal. RARE 1993 DUTCH CASSETTE IN EXCELLENT CONDITION. RELEASE YEAR :1993. RELEASE COUNTRY:HOLLAND. CONDITION CASE :EXCELLENT. ABBA OS GRANDES SUCESSOS. cassette tape from BRAZIL,1980. From: ABBA. This is an original Cassette Tape, from 1982! Cassette Tape: VG / EXCELLENT condition: Shows very little wear, felt pads are still in place, lettering looks perfect, plays great (see pics)! 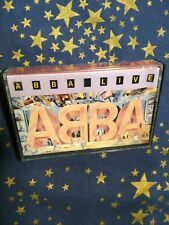 ABBA THANK YOU FOR THE MUSIC 1991 MEGA RARE CLEAR EXYUGO CASSETTE TAPE RTB!! For sale is very rare, original 1991. Kangaroo Flat, Bendigo 3555. Case is also excellent. Cassettes are in EXCELLENT working order. 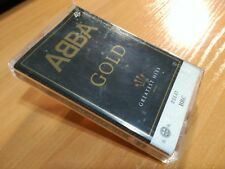 Abba cassette tape - Gold - Greatest Hits - Saudi Arabia issue on Thomsun Original from 1992. The cassette is in EX- condition. It looks fine, but the sound quality is slightly inferior to the standard UK issue. Artist: ABBA. CASSETTE TAPE ALBUM. All cassette tapes are supplied with a clean jewel case. Title: Gold. Small parcel, 2. Small parcel 2. 2 (Not "fat box"). Of CASSETTES. Heartbeaters Vol. UK Issue - 1979 Reader's Digest - Cat# RDC 90970/71. Abba cassette tape - The Singles/The First Ten Years - rare French issue on Vogue from 1982, part of the "double duree" series. The cassette and inlay are both in EX condition. Label:Takt Music ‎– 120. 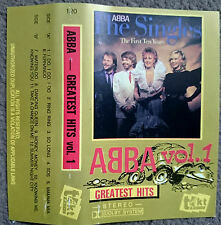 ABBA ‎–Greatest Hits vol. Style: Disco. MC / Cassette. Format:Cassette, Compilation, Unofficial Release. Location:North Wembley, London HA0. Money, Money. Dancing Queen. ARTIST; KRISTA. TITLE; SALUTE TO ABBA. The cassette, inlay and case are all in EX condition. Rest of the World - £3.70. UK 2nd class - free. Title : More Abba Gold.MORE ABBA HITS. Condition of INSERT CARD : overall near EX in the form of a stapled booklet with full end page. Artist/Composer: ABBA. CASSETTE, Compilation, Remastered. This is a genuine CASSETTE - and not a copy. TITLE; A TRIBUTE TO THE GREATEST HITS OF ABBA. Artist: ABBA. All cassette tapes are supplied with a clean jewel case. CASSETTE TAPE ALBUM. Title: Gold. Small parcel, 2. Small parcel 2. 2 (Not "fat box"). Of CASSETTES. 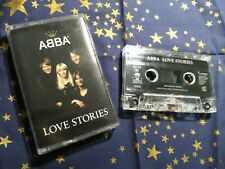 ABBA CASSETTE TAPE. THE SINGLES - THE FIRST TEN YEARS -.